There were 343 civil turbine helicopters dedicated for offshore oil and gas (O&G) operations in the Asia Pacific region as of yearend 2018. 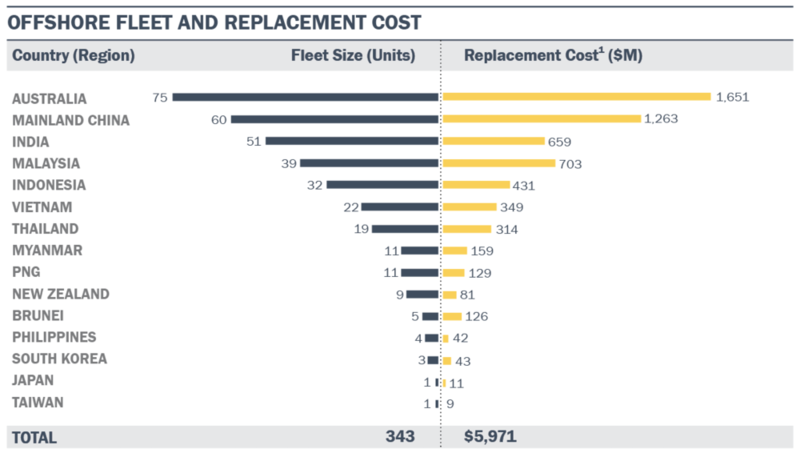 The offshore fleet makes up only around 8% of the total civil turbine helicopter fleet in terms of units, however, it represents nearly 19% of the total fleet in terms of replacement cost. ‘Replacement Cost’ figures are based on the assumption that all existing helicopters would be replaced by the latest versions of their particular OEM variant and at 2018 list prices. The fleet size reduced by five units overall since yearend 2017; attributed to seven new deliveries, 15 pre-owned additions and 27 deductions. All seven new deliveries in 2018 were Leonardo helicopters. Airbus and Sikorsky remain the most popular OEM models in terms of market share, with a fleet of 116 helicopters (34% market share) and 103 helicopters (30% market share), respectively. Leonardo came in third, with a fleet of 82 helicopters (24% market share), followed by Bell, with a fleet of 30 helicopters (9% market share). Although it witnessed a deduction of nine units — a total of 66 helicopters, the Leonardo AW139 is the single most popular turbine helicopter model used for offshore operations in the region. The Sikorsky S-92 and S-76C++ are the second and third most popular offshore models, with 39 and 37 helicopters, respectively. Australia is home to the largest fleet of O&G helicopters, with 75 helicopters (around 22% of the region’s total). Mainland China and India come in second and third, with 60 (around 17%) and 51 helicopters (around 15%), respectively. With a fleet of 35 helicopters, Citic Offshore Helicopter Co. (COHC), operating out of Mainland China, remains the operator with the largest offshore fleet in the region. Bristow Group, operating out of Australia, Malaysia, and PNG, has the second largest fleet with 24 helicopters; closely followed by Malaysia-based Weststar Aviation, with a fleet of 21. The development of offshore wind farms has presented an interesting opportunity for offshore O&G operators. The Asia-Pacific offshore wind capacity is expected to rise 20-fold within the next decade1. Taiwan may have started the trend, but Mainland China has been making huge strides in this sector and many other countries are looking to join the development. A growth in the offshore wind farms could dramatically boost the number of offshore helicopters used by the Asia-Pacific operators and help offset some of the decline in traditional upstream activity. O&G helicopter demand is related to the capital expenditures of national and major O&G companies. Although the O&G market has picked up recently, offshore helicopters still witnessed a reduction in fleet in 2018. Operators may feel that the prices are increasing at a very slow pace and are fearful that there may be a sudden price drop due to an oversupply of oil rigs all over the world. Such uncertainty and skepticism may lead operators to place helicopters in storage or change mission configuration for more profitable operations.